Google's update process is a head scratcher for sure, but all good news ahead. 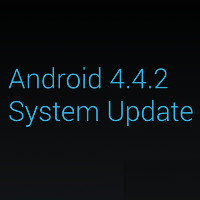 Google has finally uploaded the 4.4.2 factory images for all the current Nexus devices. This means if you still haven't got the OTA for 4.4.2 yet, you can manually install it yourself if you haven't already sideloaded the files that +Ryan Moore posted earlier. With the official files now available, you should see a lot more 4.4.2 roms popping up as well for you rooters and flashers.